99% of our tables have a 1″ MDF Core. We get our MDF (Medium Density Fiberboard) from Langboard Inc.
Langboard MDF is a GREEN product in that 100% of its wood content comes from recycled wood. Many years ago this wood was burned or filled up landfills but is now made into beautiful panels to manufacture molding, furniture, and cabinets – to name a few. Langboard MDF Willacoochee, Georgia has been certified by the Composite Panel Association as a manufacturer of Eco-Certified Composite panels (ECC). As part of that certification Langboard MDF meets CARB II specifications relating to formaldehyde emissions. This certification means Langboard panels meet requirements set forth by the California Air Resources Board (CARB) in relation to formaldehyde emissions. Every year since the 1930’s The Langdale Company has planted more trees than it has harvested. As of 2009, the company planted its 100 millionth seedling, a feat duplicated by few in the industry. The Langdale Company is committed to growing forest products for our nation’s future and the protection of the environment. The wood for Langboard is grown in sustainable managed forests and tree farms, and the manufacturing of Langboard uses nearly 90% of the log. Langboard converts the remaining bark, saw trim, and sawdust into energy. Langboard exceeds strict quality standards for environmental safety set by the regulatory authorities. 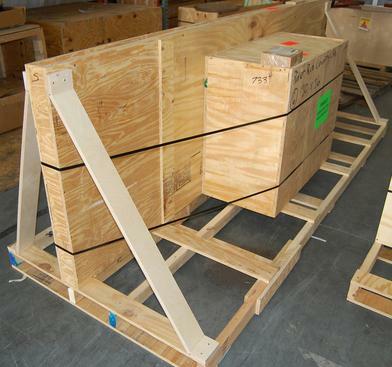 All of our custom crates are built out of 3/4″ Plywood. We purchase the plywood from Coastal Plywood Company. Coastal Plywood Company has recognized the need for sustainable forest management throughout the history of the company, long before the environmental movement became so popular. All of the logs used in the manufacture of plywood at our facility are procured within a 100 mile radius of Havana, Florida and come from American southern pine forests, which are the best and most cared for forests in the world. Since we believe in providing our customers with the most competitive pricing possible, we have chosen to forgo expensive and redundant certification programs and pass the savings on to our customers. No certification programs can make our plywood more environmentally friendly, they will only make it more expensive. You can be confident when buying our products that we meet all local, state, and federal regulations and guidelines regarding sustainable forest management. The following is our statement regarding formaldehyde emissions and our plywood products. Formaldehyde is a ubiquitous molecule, commonly found in small amounts in the environment. It’s also a naturally occurring biological molecule found in living organisms. Human blood contains about 2 ppm of formaldehyde. Coastal Plywood Company uses phenolic resin glue as the bonding agent for their high quality plywood. Therefore all APA grade-marked panel products produced by Coastal Plywood Company are manufactured in accordance with U.S. Voluntary Product Standards PS-1 or PS-2 and they exceed all U.S. requirements pertaining to formaldehyde emission standards. In fact, large-scale chamber tests have shown that formaldehyde emission levels in Coastal’s panels are no higher than the levels found naturally in the environment. Indeed, because formaldehyde levels associated with phenolic resin-bonded products are so low, these products easily meet or have been exempted from the world’s leading formaldehyde emissions standards and regulations, including the U.S. Department of Housing and Urban Development (HUD), the California Air Resources Board (CARB) Air Toxic Control Measure for Composite Wood Products, Japanese Agricultural Standards (JAS), and the EN 300 standard for European markets. In summary, the terms “formaldehyde free” and “zero formaldehyde” are misnomers since the formaldehyde molecule is all around us. But Coastal’s panel products are the solution to your “lowest formaldehyde” requirements. We purchase our hardwoods from Associated Hardwoods. Lumber companies are often portrayed as being at odds with the environment, but at Associated Hardwoods, our business and out livelihood diretly depend upon healthy, sustainable, thriving forests. That’s why we dedicate a large portion of our resources to promoting, and protecting the growth of our forests and safeguarding our environment for future generations. Associated Hardwoods has taken significant actions in all sectors of our business operations to preserve our forests and our environment. This starts with our highly-efficient, computer-controlled kilns that monitor the drying process every second 24/7, and continues to our highly-mechanized dimension mill. Invested millions of dollars in state-of-the-art lumber processing equipment that maximizes yield (reducing waste) – compared to traditional lumber processing equipment. Implemented a Customer Recycling Program which allows our customers to reduce their landfill waste. Reclaiming out wood-waste fiber through a specialized grinding technology which converts it into various forms of consumer products. 10 years ago these by-products were dumped in a landfill. Today, our landfill usage is down 74%. Reclaiming not only makes environmental sense, but lowers the cost of our production by enhancing the value of what we produce. Purchased a new negative-draft boiler which increased efficiency while reducing our carbon footprint. Set maximum speeds on all trucks for maximum fuel efficiency. Replacing our transportation fleet with lighter, more fuel-efficient, all aluminum flatbeds to maximize efficiency on every load. Our new fleet features a fuel-efficient injection system that reduce 90+% of nitrogen-oxide emissions. A veneer is a thin layer of wood produced by slicing carefully selected logs. A tree may yield 30 to 50 times more wood surface when used to produce veneer than when producing lumber. With veneer you can achieve grain patterns and effects not possible with solid hardwood. Over 98% of the tree is used in veneer production. Wastes is used for bio-energy generation, pallets, mulch, and more. Veneers will not crack, split, or warp overtime. With the top protective coat of Resin, or Ultra UV the tops will last for many years without the need of re-finishing. Table Designs has the unique capability of scanning exotic veneers which would be expensive and much harder to replace in the natural environment. Digitally printing exotic veneers or hardwoods saves trees and money! On this table we scanned a Zebrawood sheet of veneer and digitally printed the image of the veneer on the table. Another Advantage digitally printing can offer is options to alter the image and add accent lines, create patterns like this diamond box pattern and add custom logos. Digitally printing these exotic veneers is cost effective and environmentally friendly. Check out the reclaimed wood tables, these tables are made from scrap wood that are brought in dumpsters and are built into tables (in the quick version of explaining it).